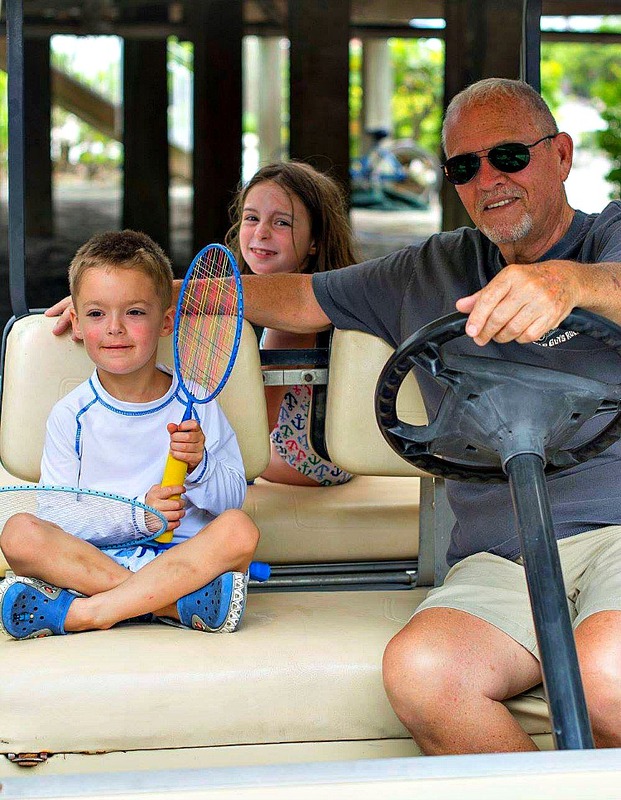 Multigenerational family vacations are priceless. But when it comes to planning, choosing the right location is key to a stress-free memory making trip. Our Globetrotting TravelingGrandmom’s family spans four generations and ranges in age from 7 to 79 with interests all over the map. When she’s planning a getaway for her group, she focuses on a place that provides just the right amount of time together balanced with enough space to keep everyone sane. Planning a multigenerational family vacation always begins with choosing the right destination. The goal is to make priceless memories and still like each other when the trip is over. Some locales work better for this type of trip than others. Every family has favorites and I’m going to share mine. Here’s more about these three ideal multigenerational family vacation destinations. 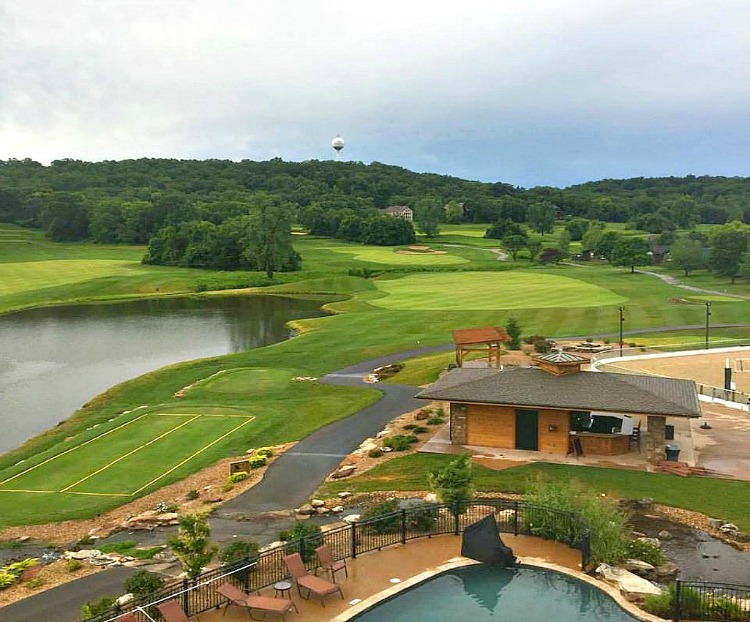 If the Midwest is on your radar, Old Kinderhook Resort makes an ideal base for exploring the Lake of the Ozarks region. Old Kinderhook offers a wide variety of options for lodging. The Lodge at Old Kinderhook overlooks the golf course and offers 84 impeccably decorated rooms. Amenities include indoor and outdoor pools and the Old Kinderhook Spa for family members in need of pampering. Other lodging options include golf cottages, patio homes, villas and estate homes with three to four bedrooms scattered throughout the golf course. The resort’s centerpiece is a Tom Weiskopf signature golf course carved from the Ozark Hills. The challenging course includes valleys, waterfalls, hills, trees, water hazards and elevation changes, along with breathtaking views. If you need a little help with your game, book a lesson with one of the resort’s pros. I recommend Robert Wilson, perhaps one of the most patient instructors on earth—I know this because he survived my lesson. When you’re ready, venture out to explore the Lake of the Ozarks region, where you’ll find a wealth of outdoor activities including boating, fishing, hiking and caving. 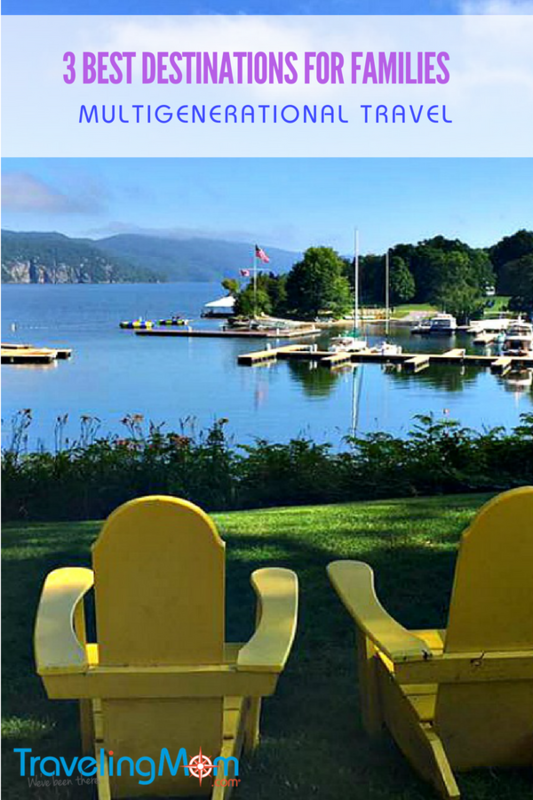 Situated at the edge of shimmering Lake Champlain, Basin Harbor Club has been a destination for families to play, relax and reconnect for more than a century. I’m not sure if it’s the lakeside setting, the large verandahs, or the summer sounds of the wooden screen doors slamming as children run in and out, but this place reminds me of the classic movie, Dirty Dancing. There are plenty of scheduled activities including fitness boot camps, golf lessons, and tennis. For the younger family members, Kids Clubs offer arts and crafts, sports, fishing, and games like Capture the Flag, scavenger hunts and water carnivals. 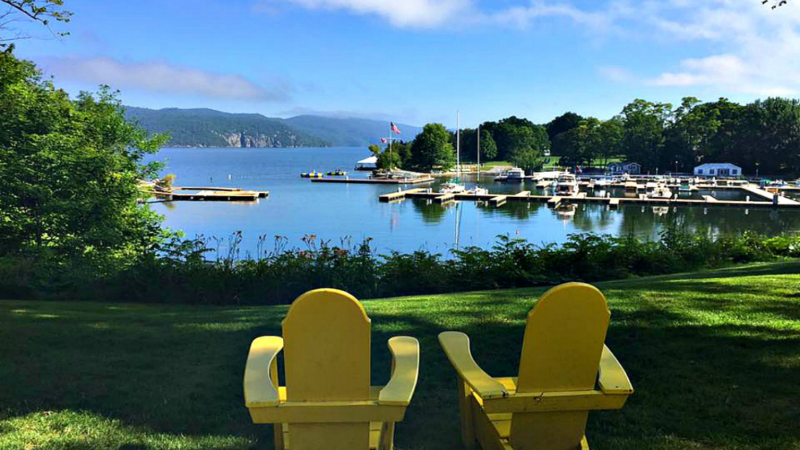 Adirondack chairs scattered throughout the resort invite you to sit, sip a glass of wine and soak in the sunshine as it glistens off the lake. 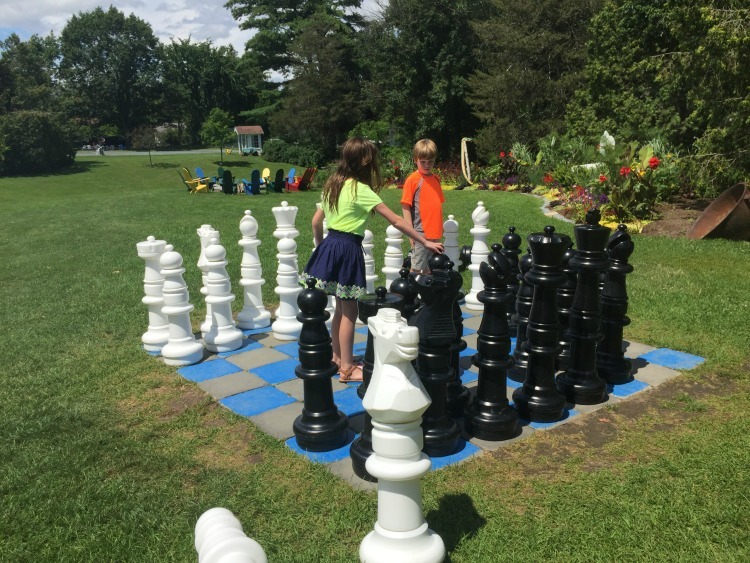 Or enjoy a little family competition with classic lawn games like croquet, badminton, giant chess and volleyball. Paddle boats, kid’s boats and a giant water trampoline make full use of the lake. Swimming while watching a movie poolside was a favorite for my grandkids. Of course, it helped that the movie was Star Wars. Lodging options include 45 charming guestrooms located in four guest houses: The Main Lodge, The Homestead, Champlain House and Summit. If you prefer more togetherness, there are 74 private lakeside cottages ranging from studio to 3-bedrooms, each with its own unique personality…just like your family members. 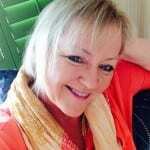 Located on Florida’s Southwest Gulf Coast approximately fifty miles north of Fort Myers, Palm Island has kept all four generations of my family happy for decades. It’s a place where you can while away the days searching for shark’s teeth on the beach, fishing in the surf or exploring by golf carts and bicycles. Exuding old-style Florida charm at every turn, villas are clustered around pools, Hydro Spas, and gas barbeque grills. Choose from beachfront units or beachview and get ready to relax and unwind. Fully equipped kitchens and plenty of barbecue grills make it easy to prepare your own meals. But if you choose to take a break, Rum Bay restaurant is located on the island. Specialties include native grouper and baby back ribs. For active pursuits, there are 11 tennis courts. Lessons and clinics are available with the resort’s tennis director. 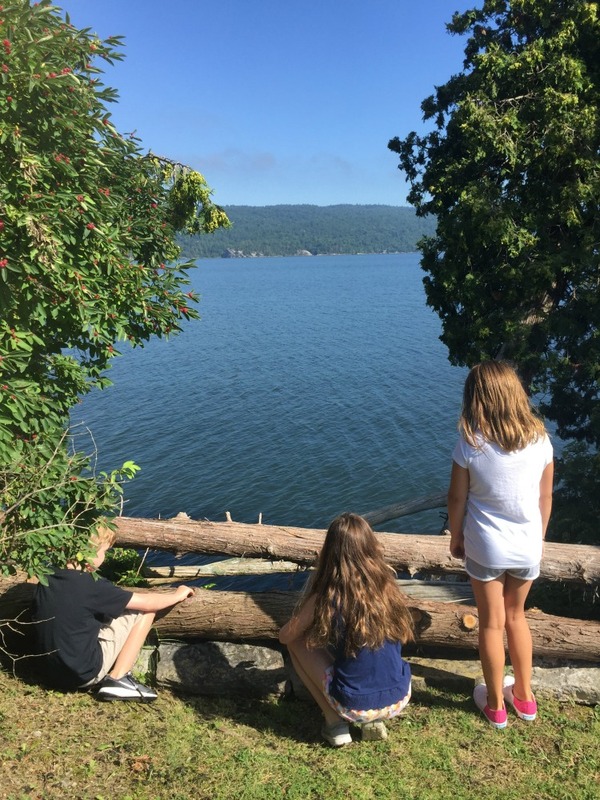 Family adventure packages can be arranged through several independent companies for fishing, sightseeing, sandbar eco-adventures and wildlife viewing. Rental items like kayaks, canoes, boogie boards, rafts, and snorkeling gear help to maximize the water fun. 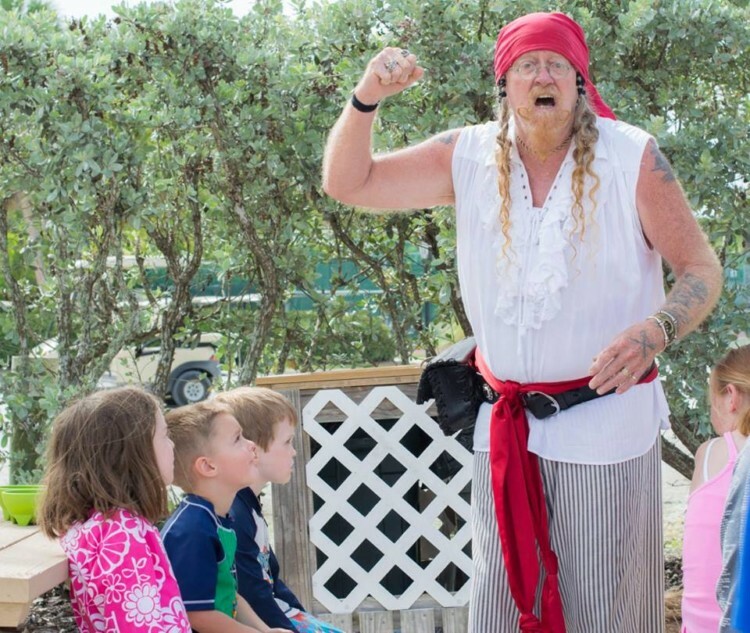 The island’s resident pirate, Red Beard and his trusty parrot add more entertainment for the kids. Red Beard is always happy to teach the little ones how to make sand art and pirate beads. He’ll also regal them with stories of his fights with the evil Pirate Black Beard. For me, one of the best experiences at Palm Island is watching the sunset over the Gulf of Mexico as dolphins silhouetted against the fading sunlight play in the warm waters. That’s hard to beat!